Costa Maya Fly Fishing - A Great Cruise Shore Excursion! FROM COSTA MAYA - $350.00 $250.00 - YOU SAVE 30% ! One or two people only per boat. Fly Fishing has become our premier excursion. You will be introduced to a multi-lingual guide who will take you directly to the finest spots on Chetumal Bay, or if you prefer a secluded virgin lake. You will find an abundance of bonefish, tarpon, permit, snapper, and snook. Your guide will help you master the best fly fishing techniques for each type of fish. The boats are carefully adapted for fly fishing, equipped with large forward casting decks, safety gear, and radio contact with shore. Chetumal Bay has thousands of acres of hard white sand flats surrounded by mangroves. The lagoons are secluded and quiet. Wherever you go, you are assured of a peaceful challenge of your own. 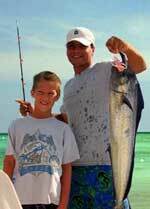 Ask for your Grand Slam Certificate if you catch a bonefish, a tarpon AND a permit! Or the ultimate Super Grand Slam Trophy with a snook also! Your reservation includes up to 4 hours on the boat, plus 1.5 hours round trip for transportation to the fishing grounds. Too long for you? No problem. You don't have to take the full four hours if you don't want to. We'll make it work with your cruise schedule. Tour Schedule: Daily - Time depends on your schedule. Mahahual and Cruise Ship Guests: Transportation from Mahahual or the Cruise Pier is not included in the price. We can arrange private round-trip transportation for you for $150.00 total cost (not per person), paid in cash directly to the driver on the day of the tour, or you are also free to provide your own transportation. It is about a 45 minute drive to Xcalak.